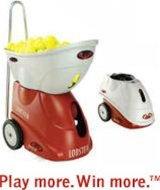 If your focus is having fun and improving your tennis game with an affordable battery-operated tennis ball machine, the Lobster Sports Elite One is the perfect choice! Designed for maximum durability, its 42-pound ergonomic design and oversize-wheels allow for easy transport, even with a full hopper of 150 balls. A 4- to 8-hour battery helps ensure plenty of court time between recharges. My Lobster Ball Machine is a great machine. I can actually get a better workout with the ball machine than playing a match. The oscillation is random and is great for groundstrokes and volleys. The 2 button remote is not the greatest since it only reaches about 15-20 feet away. Sometimes you press the button and it doesn't always stop the feeding or oscillation. But it is great once you get it throwing balls at you. Very easy to transport as well.